Traveling is great -- nay, amazing. And travel that requires a passport can be even more fulfilling for those willing to open their minds to new cultures (and, perhaps, deal with entirely too much security screening). But here's the thing -- travel is a lot better, generally speaking, with an internet connection within arm's reach. Things are never more likely to go awry than when you leave your comfort zone (or, you know, home nation), and we here at Engadget have been investigating the best methods for maintaining a connection whilst abroad for the better part of our lives. To date, you've got a smattering of options: rent a mobile hotspot from XCom Global, pick up a rental SIM from iPhoneTrip, pray that you can find a shop that rents data SIMs upon your arrival or pony up for whatever absurd roaming fees that your home operator deems fit. All of the above options have their pros and cons, but the good news here is that your choices are expanding. As the market for ubiquitous connections continues to grow, another player has recently entered the market. Tep Wireless began as a hotspot rental service that mainly looked after those traversing the United Kingdom, but recently, it expanded its coverage umbrella to include some 38 countries across Europe and 50 nations total. 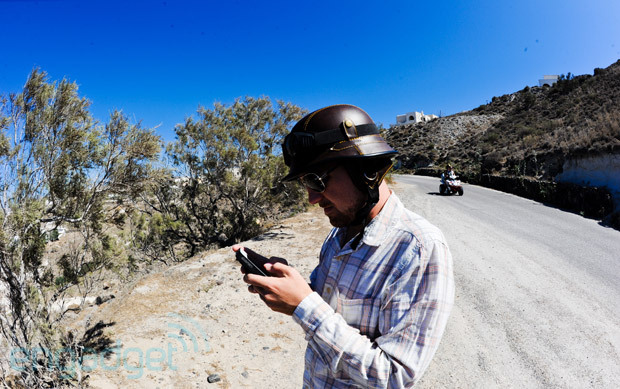 This here editor recently had the opportunity to cross through four of those on a single journey, with a Tep hotspot in hand the entire way. Care to see how things turned out? Let's reconvene after the break. By offering a great hotspot and excellent support, Tep's service is awesome for keeping business travelers connected awhile abroad. The unfortunate part about wrangling some sort of international hotspot is that it requires a good deal of research and patience on the part of the consumer. In one's homeland, you simply flip on your smartphone and access anything -- within the limits of your data tier, of course. When you zip across some imaginary line requiring a passport, things change. For those who don't bother to purchase an international data package ahead of time from their native carrier, simply loading 20 to 30 emails upon landing in Europe can amount to $50 or more being tacked on to the next bill. It's not uncommon to see US carriers charge $5-plus per megabyte when roaming on overseas data networks. (And in case that's hard to visualize, your average FaceTime call can chew through 3MB in about 60 seconds.) And once you're in Europe, it's also not uncommon to see hotels charge upwards of 10 to 20 euros per day for a connection that doesn't leave your room, probably won't extend beyond one device and will almost certainly disappoint in terms of speed and reliability. When you zip across some imaginary line requiring a passport, things change. But, of course, the charges are so insane that it's simply worth putting in the effort to find an alternative. Tep Wireless actually makes this about as effortless as you could hope for, but it's still worth breaking down the coverage and cost options. For light users who simply need to keep up with email each evening and browse the occasional technology news site -- ahem -- Tep offers 1, 5, 10, 15 and 30 day rentals ranging from $30 to $120 with between 150MB and 4.5GB of included data. If selecting that, US customers will receive a Huawei E586 mobile hotspot in the mail, approximately two to three days prior to their departure. If you chew through your allotment, you can pay an extra $6.95 per day for an "unlimited" bucket. For your average weeklong trip to Europe, that amounts to $35. If heading outside of the EU, you'll obviously pay a bit more. That's still marginally cheaper than XCom Global and iPhoneTrip on a per-day basis, but still probably out of reach for most common tourists. For business travelers, it's far more palatable. 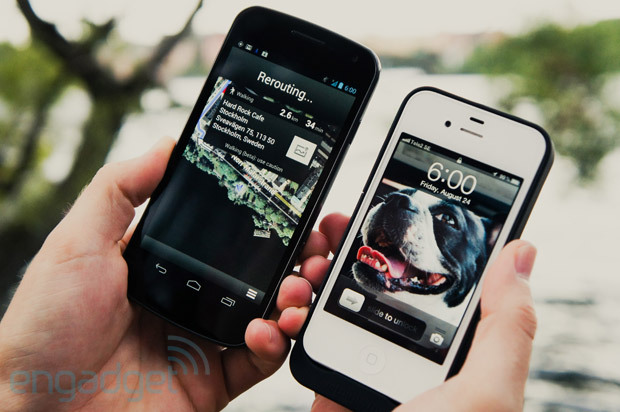 It's also worth taking your home-based roaming alternatives. Even AT&T's newly discounted international data packages offer just 800MB for $120 and that data is trapped on your smartphone. 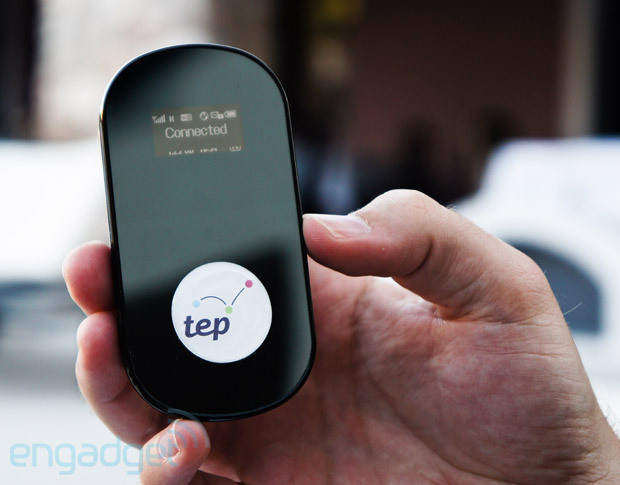 With Tep's hotspot, up to five WiFi-enabled products can connect to it. The only other major cost to keep in mind is the security deposit; £120 per device is held when you rent a hotspot, but it's reimbursed fully once the unit is sent back in working order. As mentioned earlier, the Huawei E586 that Tep relies on is a glorious device. One of my major gripes with XCom's rival service is the use of aging Novatel MiFi units, which lack an embedded display. The E586 is not only shockingly compact (small enough to slip into your average fifth pocket), but it boasts a surprisingly informative screen. The front panel, which was well-described in the documentation we received, shows a signal strength bar, the name of the network we were connected to and a battery life indicator. Moreover, the central section would change to alert us to exactly what was going on. When we first flipped it on in Stockholm, our first destination, the device showed "No Connection" for approximately three minutes. Without touching anything, it finally moved on to "Searching," followed by "Connecting" and eventually "Connected." While that first alert was unsettling, it does take a fresh SIM a couple of minutes to orient itself, settle on a roaming operator and make the requisite connections. The Huawei E586 that Tep relies on is a glorious device. The bundle you receive upon ordering is fairly simple. It's a padded, zippered pouch that includes the E586 hotspot, a spare battery and charger, an EU charging cable, a UK power plug adapter and a micro-USB charging cord. (Yes, for those wondering, you can charge the E586 through your computer while it's actively connected and serving data.) The Huawei hotspot, unlike a few XCom units that I've used, is blissfully simple to operate. It comes pre-activated and pre-charged; just hold the power button for a few seconds and the unit itself does the rest -- letting you know how the process is doing all the while via the embedded display. Handily, Tep includes the device's SSID (the WiFi name you'll search for on your phone, laptop, tablet, etc.) on the rear of the device, along with the password. With XCom, this particular editor recalls having to dig into the hotspot's admin panel via a web browser and reconfigure things; there are no such headaches associated with Tep's alternative. Perhaps best of all, the E586 keeps a continuous, real-time look at data consumption on its front display. Needless to say, this was a godsend in use; we could always peek over and keep tabs on how much data we had used during our total time with the device. As for portability, the battery can easily last through four solid hours of use, with recharges taking between two and six hours depending on your power source (i.e., wall versus USB). So, we've hopefully conveyed that Tep's choice of hotspot is a sound one, and the pricing here is manageable for light users. But of course, all that's for naught if things don't go well on the usability end. According to Tep, it relies mostly on Vodafone for servicing its 38 nation EU hotspots, but the carrier you'll use depends on which network the device decides to roam with. In Stockholm, for instance, this editor routinely found himself connected to Telenor Sweden, which worked swimmingly. On average, users are told to expect connection speeds of around 5.6 Mbps or so while in 3G / HSPA+ areas (e.g., any major city in Europe), and it's worth noting that the hotspots today don't offer LTE / WiMAX. We routinely found ourselves forgetting that we weren't using a home broadband connection. In testing, we found those claims to be just about right, though we did experience a very small number of dropouts and shifting to slower 2G networks while crossing through more rural areas on a train from Stockholm to Gothenburg. That said, we've seen similar dropouts for years; it's an unfortunate reality that can't be blamed on Tep, but on the lack of data coverage in locales with more sheep than humans. When situated in areas where 3G coverage was available, we routinely found ourselves forgetting that we weren't using a home broadband connection. The hotspot was able to maintain a tight, high-speed connection throughout populated areas of Sweden, Denmark, Austria and Greece, and perhaps best of all, we didn't have to continually reset the device to trick it into reconnecting. It's probably partly due to Europe's data networks simply being more mature (and their footprints being larger) than when we last tested them in a similar review in 2010, but we feel comfortable applauding Tep on landing laudable roaming agreements and choosing a phenomenal piece of hardware to offer its service through. Outside of performance in the field, this is the aspect that makes or breaks a service-oriented company. After receiving our order a few weeks prior to departure, Tep shipped our hotspot to a US mailing address. It arrived 48 hours prior to departure, just as advertised. Annoyingly, the box that arrived was empty; at some point during the journey, the package had been ripped open, gutted and taped back together. Awesome. Upon discovering our plight, we pinged Tep and explained the situation -- within two hours, we were in communication with the company, which was planning to overnight another unit from its UK headquarters to our hotel in Stockholm. Upon checking in, we were handed a glistening FedEx package right at the hotel, this time with a Tep hotspot safely tucked inside. Frankly, that's about as good as you could ever wish for, and we can only hope that our experience with Tep's support is the rule and not the exception. On the company's FAQ page, it makes quite clear that it's eager and willing to help. Once we arrived in Europe, we never had to reach out to clear up any malfunctions, though having both UK and US support numbers was a nice touch. Sadly, there aren't any EU numbers to call, but it's reason enough to load up your Skype account with a few credits in the event that you'd need to dial out internationally. Hopping across networks in varying nations is no small technological feat. Of course, it wouldn't be an international hotspot review without a quirk or two. After staying connected in Sweden, we ran into problems in Denmark. Inexplicably, the device simply said "No Network" each time we rebooted it, despite the fact that a nearby smartphone was sucking down data on a separate SIM just fine. After a day of toiling, we contacted the company and were run through a reprogramming effort. Basically, you'll have to connect to the device, surf over to the admin page, reset a few things, input a new profile and save all of the changes. For a tech editor, it wasn't too much trouble; for the everyman, it may be more than a mere annoyance. Furthermore, had we not had internet access in our hotel, we wouldn't have been able to ping the company to get our hotspot back online -- a Catch-22 of sorts. It's easy to take things for granted. Hopping across networks in varying nations is no small technological feat, and there's always a better-than-average chance that you'll hit a snag somewhere along the way if you cross too many borders. That said, Tep Wireless was quick to deliver a remedy -- we just wish the how-to was in the package it originally sent. We'd rather them anticipate the problem than wait for you to have one. In speaking with the company about the issue, it acknowledged that hopping countries can infrequently cause things to hang, but that it's hoping the next generation of hotspot hardware will have a workaround that's easier for average consumers to implement. 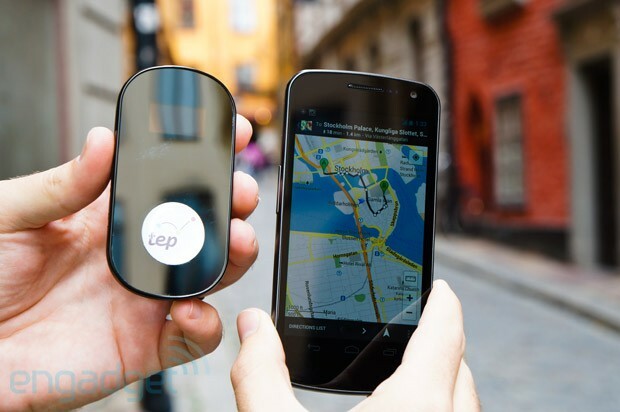 Put simply, Tep is our new favorite hotspot rental outlet for travel to the UK and Europe. No, its offerings don't cover the 195 nations that XCom Global can, but it's also far more affordable for short-term jaunts. For average users taking a weeklong vacation to Europe, 1GB is apt to be sufficient, and it's tough to argue with $5-$10 per day. (Before you even try, just have a look at what most European hotels charge for daily internet access that can't leave the confines of your room.) Even if you go over, being billed for unlimited data from Tep will still see your grand total lower than what you'd pay a US carrier for an international data pack. The reality remains that staying connected while traveling abroad is no cheap task. In use, the included Huawei E586 hotspot performed admirably throughout the four nations in Europe that we covered. Never were images compressed (as some mobile / tethered options do), and rarely did we have to reset the device to regain a connection. Yes, we had to reset the settings once after skipping into another nation, but the overall headache factor was delightfully low. Shipping the unit back from the US was as simple as affixing a prepaid label that arrived via email, and the service and support we received were second to none. This particular editor has traveled long enough to know that having access to data in a foreign country can be the difference between an enjoyable journey and an unpleasant one. After all, you never know when you'll need to sift through your email archives to prove that you prepaid for a room, or when you'll need to consult Yelp to figure out which eatery nearby is the best of the options that you can't pronounce. The reality remains that staying connected while traveling abroad is no cheap task. But in a world where you can have access to local Google searches, the ability to navigate via Maps and the opportunity to earn more Foursquare badges than all of your other friends combined, Tep Wireless offers up an option that's easy to recommend.